Zebronics India Pvt Ltd, India’s leading supplier of IT peripherals, Audio/Video and Surveillance products announces another Sound performer unlike any other Monster pro x10 and Monster pro 2x10 the ultimate expression of Zebronics MONSTER SOUND – that is guaranteed to get the party started off on the right note. 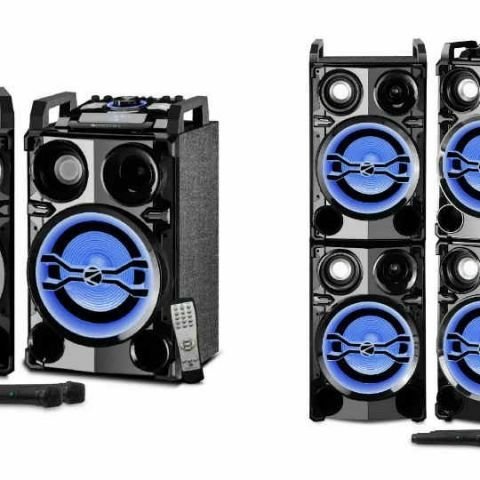 Aimed at the party enthusiasts, both the speakers are designed to generate Monster SOUND for your party next door. With its dramatic styling and unique LED lights, the speaker brings an edgy roughness balanced with style. The speaker delivers big, bold enveloping sound with a wonderful balance between hefty bass, smooth midrange and a nearly tangible sense of space. Clearly, its everything you would want in a Tower Speaker. Both the speakers Monster Pro x10 and Monster Pro 2x10 are outfitted with the powerful 100 and 120W Total RMS Power. With its strong sound 3-way technology, Monster pro x10 comes with Dual 25cms low end drivers, Dual 10cms mid range and Dual 4cms tweeters. Monster pro 2x10 is equipped with Quad 25cms, 10cms and 4cms tweeter. A powerful dual bass reflex design and perfectly harmonized components create a dynamic sound with each tone mapping a distortion free deep bass foundation to crystal-clear highs, thanks, in part, to the low-resonance wooden cabinet. Unique to Zebronics DJ speakers, the included control accessory at the top allows users to simultaneously operate the controls independently – Bass, treble, volume, power and switchable input channels of both speakers. The dial style control knob also engages the 5-band equaliser and multimedia controls. Adding which, the Speakers also supports the Karaoke function with bundled Dual Wireless microphones and option for dual wired Microphones. Aided with Bluetooth, the speaker also allows seamless connectivity with several gadgets in the range of 10m, letting you enjoy sound wirelessly. It also makes sure to keep your entertainment quotient intact, with several connectivity options which includes AUX, Micro SD, USB support etc. Keeping the controls with you is the Wireless remote. Available with 1 year warranty the product is available with leading retail stores across India. Price for Monster pro x10 is 13,131/- and Monster pro 2x10 18,181/-.